Atlantic City Multi Hand Blackjack is an American hole card game, played with eight standard decks of 52 playing cards; these cards are re-shuttled after each game. Multi-hand Atlantic City Blackjack plays on same principle as the Single-hand game; the only major difference is that in Atlantic City Multi Hand Blckjack, players can bet up to 5 hands played simultaneously and independently from the other. The aim of the game is to beat the dealer with cards that equal or are closer to 21. The trick behind this game is that with every hand, you make sure that your card value is higher than that of the dealer or equals 21, without busting. Busting is a term used in blackjack implying that your card value has exceeded 21 and in that case you are deemed the loser of that specific round. 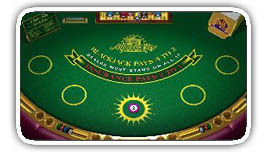 The card values in blackjack are different from other online casino games using standard decks. All the royal or face cards (King, Queen and Jack) and card number (ten) are each worth ten. The other cards from the number 2 card to number 9 are counted at face value while an Ace is worth either 1 or 11. At the beginning of each game, you’ll have to place a bet (up to five) and you’ll be allocated two cards face up. The dealer will also receive two cards, one face up and the other face down. Once you have dealt your cards, the dealer will reveal the sum of his cards and its lower than yours, you win. If you happen to have an Ace, you can use it split the game and have two separate hands. You can only split the hand once and your winning payout percentage is reduced when you a split game. Note that the strongest is when you have an Ace and ten, which is referred to as Blackjack.